I saw the yarn, bought it, chose a pattern, made a scarf. Here it is! I found this one row lace pattern somewhere on the internet and was so happy with the results! Don't you just love the yarn? This knit really does look stunning when worn over anything! If you haven't tried a little shell stitch pattern, its a very simple and effective pattern to use. Typically, the stitch pattern accounts for RS and WS, but I knitted this in the round so all the WS are actually RS! (Does this make sense?) Anyways, the modified stitch pattern to be knitted in the round is below. - 300g of bulky #5 yarn. Round 1 and 2: Knit all sts. Round 4: Knit all sts. 1) Cast on 121 sts and knit the little shell stitch pattern until piece measures approx. 11 inches in length. 3) Knit 5 rounds of Ribbed collar row: *K1,P1, repeat *to last st, knit 1 st.
4) break yarn and weave in tail end. Well, sometimes you just need to add some zing to knitting with adding lace, texture, or cables. Here is a chevron pattern done 3 times along a scarf. The scarf begins and ends with a 1x1 rib. By the way, I am so in love with this Bernat Softee Chunky Yarn! The dark green is so saturating and eye catching. I haven't been exploring pies for a long time (years even!) due to many depressing failed attempts. However, I finally have a proven recipe that is relatively easy to make and will impress at any potluck or dinner event. So search no more pie-making yearners, this is legitimately tried, tested, and true. Here we go! 1) Mix flour and salt in a bowl. 2) Add cubes of shortening to bowl and start mixing to create dough. Add tbsp of cold water for consistency to make dough stick together and not become crumbly. 3) Roll out dough and lay on 9" pie shell. Cut dough to fit shell. Do this twice to get 2 crusts (1 for bottom, 1 for top). 4) Mix all of the pie filling ingredients together in a bowl. Set aside and let sit for 30 minutes to let apple juices flow out of apple slices. This helps in preventing your pie from becoming a pool of liquid mess! 5) Scoop filling into pie shell, making sure to drain as much juice out and lay the apple slices evenly throughout pie shell. This helps the pie keep its structure when cutting into it. 6) Using a cookie cutter, cut a hole in the middle of the 2nd top pie crust shell for ventilation. Place 2nd pie shell over pie as the top shell and seal edges together by pressing edges down with a fork. 7) Brush egg wash all over top shell. 8) Put pie on a baking sheet, back at 400 degrees F for 10 minutes, then at 375 degrees F for 30 minutes. 9) Remove pie from oven, let cool. Impress people with your yummy homemade apple pie! Oh so warm and colorful beanies.... except I grew up calling them toques. 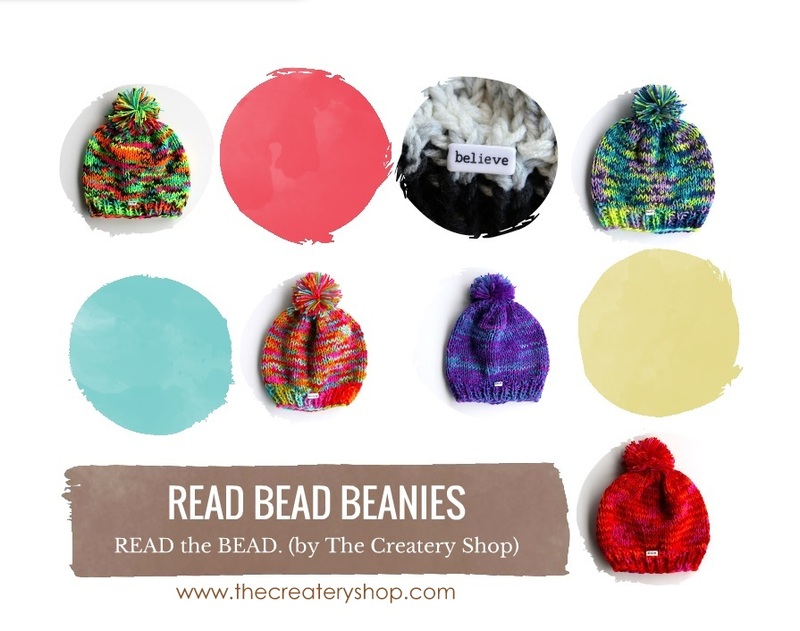 Launching my latest collection of Read Bead Beanies! 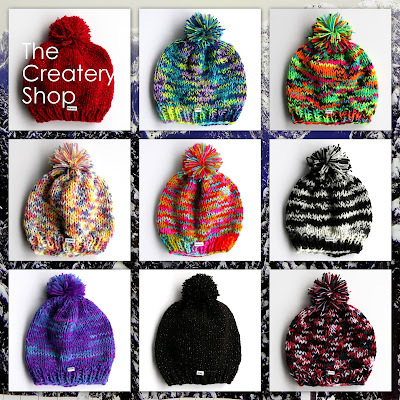 Every beanie is 100% hand-made and unique. Inspirational text beads to read make every beanie individually yours. Re-invigorated by beautiful winter scenes and outdoor views of the world. 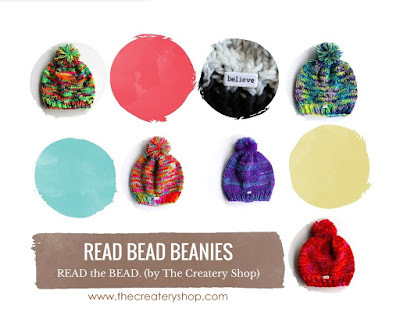 Every beanie has a bead with an inspired word. 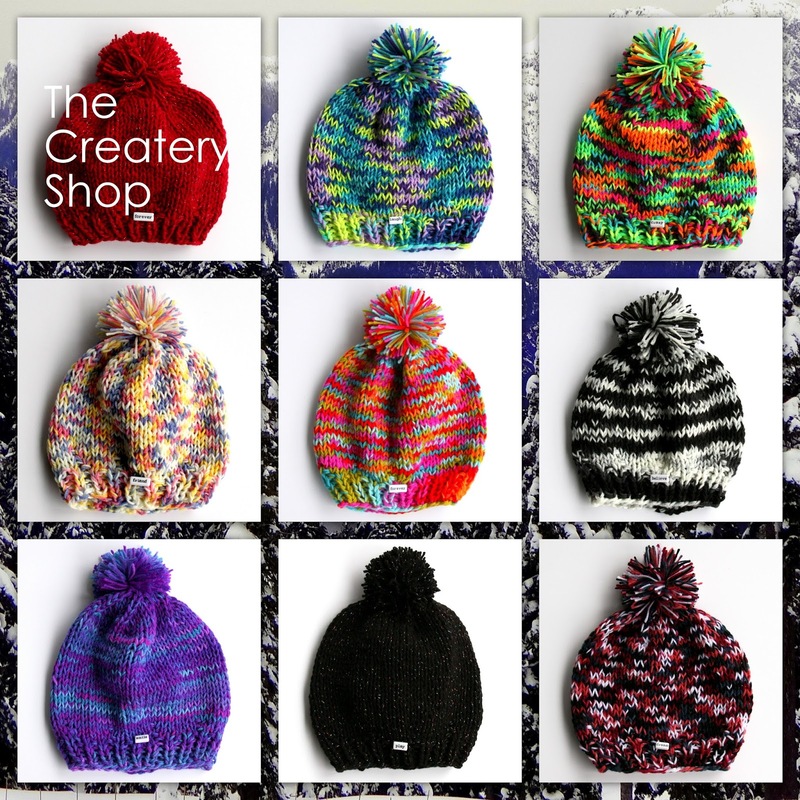 Dyed yarn in striking, fun, and edgy colors that will stand out in the blinding snow. - 100% hand-made, made in Canada. - 100% acrylic yarn, so it won't shrink, fade, keep it's shape, minimize pill, and super durable. - Machine washable and dryable. Use normal to low heat. - Do not bleach, do not iron, do not dry clean. - Every item is uniquely made, slight variations on each product from catalogue photo is normal. - Product is shipped from Vancouver and Greater Vancouver Area, Canada. - We ship across North America! Canada and United States of America. - Shipping duration typically 2 weeks within North America. The Createry Shop is not responsible for delays crossing borders, customs, or issues with incorrect addresses and courier errors. - Please contact the Createry Shop directly if you require international shipping information. My cookie exchange this year requires over 70 pieces of sweet treats to be packaged up and passed around with care. 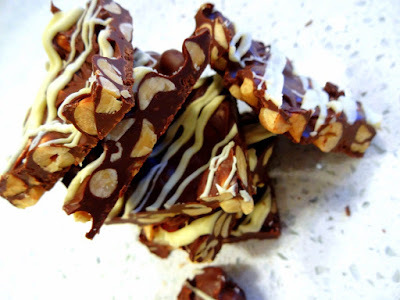 I just couldn't imagine an easier, quicker, and yummier way to accomplish this than with an awesome chocolate bark recipe! What makes this awesome-r than the rest? 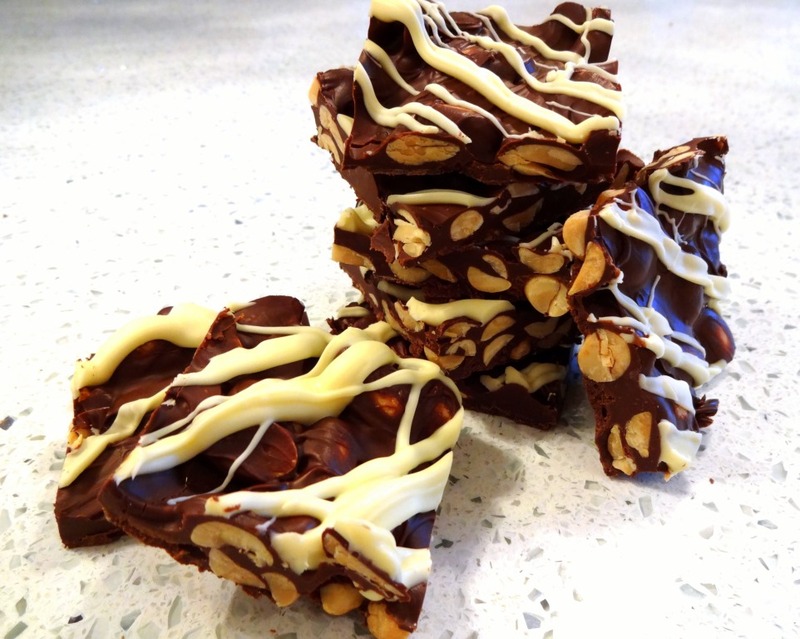 No need to buy chunks of chocolate bricks and chopping them down to melt. All you need is chocolate chips, a BIG bag of peanuts, and anything else your heart desires (I have listed some delish optionals at the end of the recipe). Oh, and did I mention it looks absolutely fabulous once you cut them up and present them? This is definitely one of my go-to recipe hacks for anybody ready to impress. 1) Take a 17x12 large baking sheet and line it with parchment paper. Do not grease it! 2) In a microwave safe bowl, put all of your dark chocolate chips in it and microwave at 1 minute intervals, stirring after each minute to ensure the chips are melted evenly. 3) Once completely melted, add in peanuts and stir together until fully mixed. 4) Pour mixture onto baking sheet and spread out. Ensure even spread. 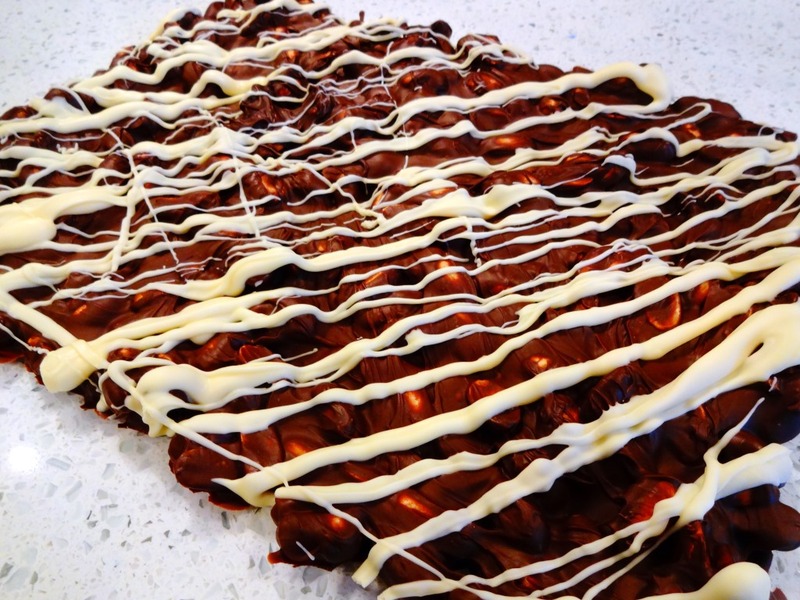 5) Now in another microwave safe bowl, melt white chocolate chips and drizzle it on top of the spread. 6) Allow to cool and solidify for about 2 hours. 7) Remove from sheet and cut into pieces. Optional items to try out: dried cranberries, coconut shavings, pecans, almonds, and even sunflower seeds! My girl is into Shopkins. Really into Shopkins. After her birthday yesterday I realized how much more her friends are into Shopkins - ravenous, impulsive, electrified little girls feasting their eyes over these tiny plastic and rubber tokens once they saw them sitting on a pillow of icing. Just like savvy car salesmen, the moment they found their goody bags filled with more Shopkin paraphernalia, they started wheeling and dealing with each other like their life depended on just closing the sale. "How about I trade you the Cheeky Chocolate for your Kooky Cookie?" "If you want Gram Jam I can throw in D'Lish Donut for your Apple Blossom." Me: "So what's the cheese's name". Unimpressed kid: "Cheesy". Me: "Of course it is." The word I'm trying to find here is.... Anyways. Enjoy these Shopkin Cupcakes! Here it is on the big day, everyone loved the colors of the ombre and they did comment on how it could look like a wedding day cake if done up in all white or cream colors. 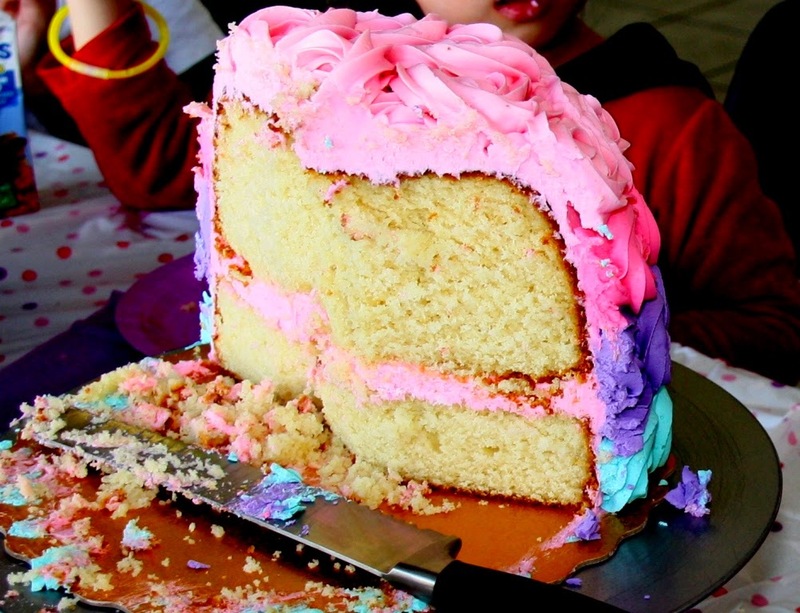 By the way, each slice of cake was enormous in height. 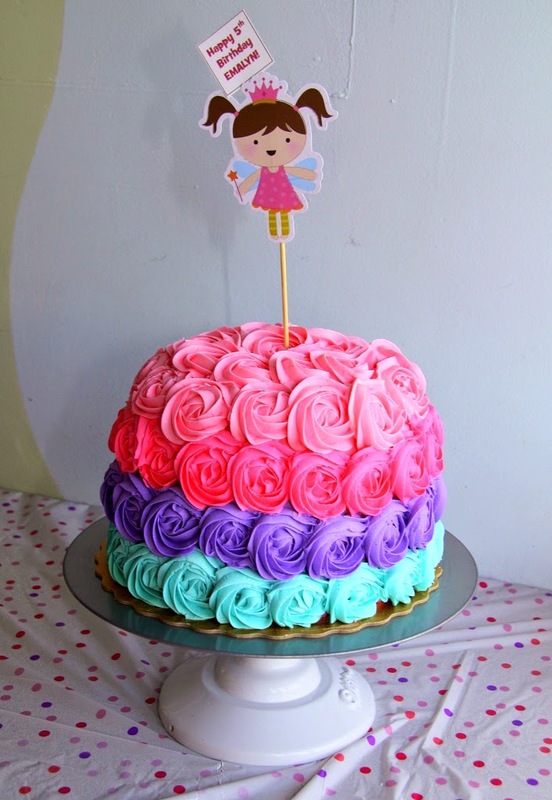 Hope this inspires you to do your own rosette cake! Went to my local cupcakery shop and as I walked in I could not stop looking at this one wedding cake completely covered in rosettes with piped icing. 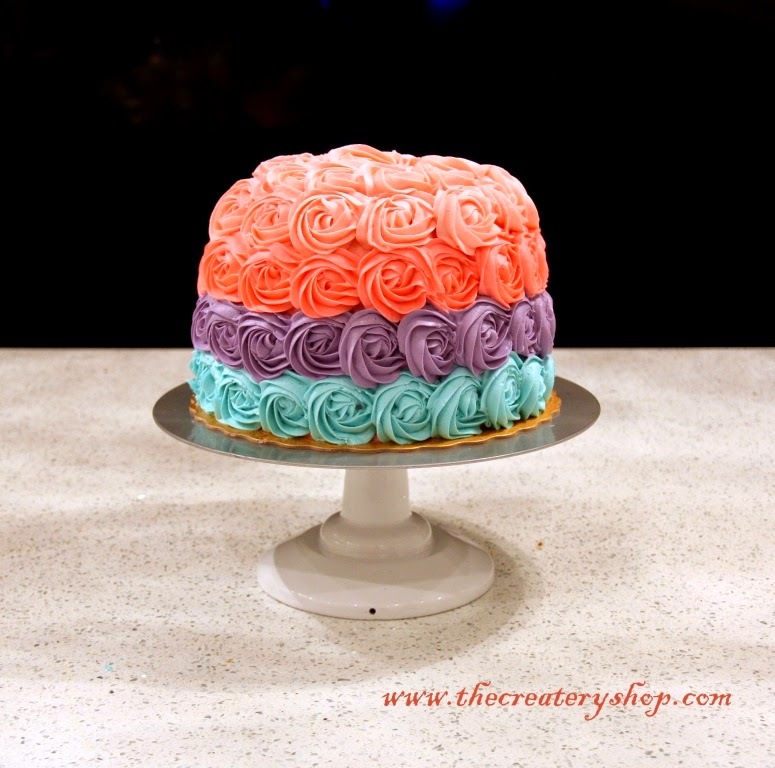 It looked so romantic and gave me this feeling of wanting to practice my piping techniques again. I think I've been too obsessed with fondant lately I forgot all the things you can do with just a bag of colorful icing and a good sturdy wrist. This also reminded me how much hard work it is to make cakes, and how much I love doing it (this particular cake is an 8" two-layer vanilla cake with a dome shaped top.... and it weighs like a brick!) Hope you like it.